8 year/s ago 1868 Visit WebsiteIndustrialBroken link? As one of the premier energy consulting companies in China, we are dedicated to help you to know more about China coal industry and doing business in China. We have a team of well-known and experienced experts, analysts, and engineering staff focusing on different areas in China coal industry. So far, we have executed more than 400 projects in engineering and consulting for famous companies both from China and overseas. We operate the Shanxi Coal / Coke Exchange, host several websites, and we have the most comprehensive databases available in coal and coke industries. 1. Send us email by info@coalresource.com or chinacoalresource@gmail.com. 2. Live support by click http://en.sxcoal.com/Live%20Support.htm to reach our experts online service. 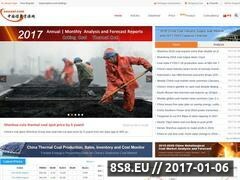 Sorry, BrowseInter.net Website Directory does not contain yet any other websites related to coal market news, coal price or coal resource!